We’d love your help. 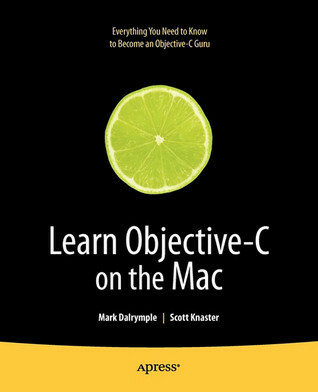 Let us know what’s wrong with this preview of Learn Objective-C on the Mac by Mark Dalrymple. Take your coding skills to the next level with this extensive guide to Objective-C, the native programming language for developing sophisticated software applications for Mac OS X. Objective-C is a powerful, object-oriented extension of C, making this book the perfect follow-up to Dave Mark's bestselling Learn C on the Mac, Mac OS X Edition. Whether you're an experienced C Take your coding skills to the next level with this extensive guide to Objective-C, the native programming language for developing sophisticated software applications for Mac OS X. Objective-C is a powerful, object-oriented extension of C, making this book the perfect follow-up to Dave Mark's bestselling Learn C on the Mac, Mac OS X Edition. Whether you're an experienced C programmer or you're coming from a different language such as C++ or Java, leading Mac experts Mark Dalrymple and Scott Knaster show you how to harness the powers of Objective-C in your applications! To ask other readers questions about Learn Objective-C on the Mac, please sign up. This is a great book. I read it after finishing Learn C on the Mac (and in fact I think it's designed to be a sequel to that book). It's not quite as funny as Learn C (though it desperately tries to be, so it can be dry to read through at times. Nevertheless it's very well written and easy to understand. The only reason this is four stars is because they don't introduce some methods before you use them. They make a point that this is not an introduction to C. (Apress wants you to buy Learn C on the Mac, a 5-star book in it's own right). But there's no good reason they couldn't give better explanations along the way. Still, there's this moment where things started to click and I thought, "holy s#]7! I'm writing a program in Obkective C."
The book is a good introduction to Objective-C language, although it contains some bulk like introduction to OOP and some not quite funny jokes. The book explains the basics of Objective C and contains good examples and explanations of some tricks and pitfalls. When you open XCode (updated version), you will be absolutely be lost when trying to read and try out examples for the first few chapters. Outdated but still worth reading/ scanning. There are some chapters which seem to be relevant. The memory management chapter can be skipped. Good usage for language usage tips, and for coding practices. Dip into as a reference periodically. Pretty good. Gave me a decent grasp of the language in about a week.